It’s unfortunate that we arrived in Damascus on such a negative note, especially because it was G’s 25th birthday and I was in no state to celebrate. However, it was comforting to be in a bigger city and we stayed at Lindsay’s place, so it was even better. Talking about my hospital experience may not interest most, but I feel it is necessary to tell people how positive my experience was at the Cham Clinic. First of all, if you want fast, good, and English-speaking health care in Syria, then you must go private. Otherwise, the state system is available for everyone, but you always risk having to wait a while and the standards may not be what you’re used to. The average price for a consultation in a private clinic in Syria is about 1000 SYP or about 15 Euros. I wasn’t willing to take any more risks and I was getting progressively worse, so I went private. Cham Clinic is small, central and clean with a very helpful and caring staff. I will spare you all the details of how bad I really got, but I will tell you that I had food poisoning and gastroenteritis, was put on an IV for five hours and had 6 different antibiotics injected in me. Needless to say, I started crying at the sight of my first needle and all I could think about was going home. My first IV ever…. and it was in Syria. Excellent. I think I was extra emotional because it was G’s birthday and we were spending it in a hospital. Well, G and Lindsay picked me up after about 6 hours and I barely remember anything else about that night except waking up the next day feeling weak and drugged, but slightly better. After all… it couldn’t have gotten worse. After three days of laying in bed and recovering I motivated myself to take a walk around the city. After one hour I could feel my body wanting to go back to bed… instead I treated myself and G to a tea and muffin at Costa (at the Four Seasons). It was a little slice of home in a much needed moment. Feeling stronger (and poorer. tea+muffin=Syrian budget for four days) we spent the rest of the day exploring Damascus. 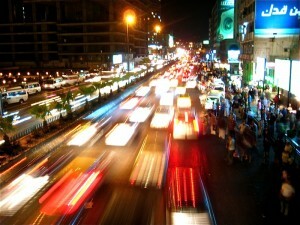 It’s a beautiful, chaotic, and lively city. You can walk for hours aimlessly through the old town and it’s souqs. It’s very different from it’s rival city, Aleppo, with more trees, quainter areas, cleaner streets and more tourists. The streets bustle with a mix of students learning Arabic and Syrian students speaking English. 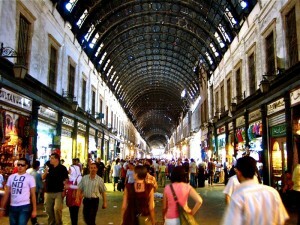 The souq is different too, if you ask people from Aleppo they say their souq is better and vice-versa. The fact is, they are completely different and both worth a visit.